With the departure of the enigmatic figure Jose Mourinho, and the arrival of the comparatively easy-going Carlos Ancelotti, the next chapter in Real Madrid's history book is about to be written. Over the course of this summer's friendly matches, which so far Real Madrid have gone through unbeaten, fans have skeptically watched the careful formation of Ancelotti's vision. The Italian manager, who coached an AC Milan squad to two Champions League victories over four years (not to mention he also won two CL titles himself as a Milan player), is not afraid to tinker. His early experiences managing (or mismanaging) talents such as Gianfranco Zola and Thierry Henry eventually led him to reconsider his strict adherence to a 4–4–2 formation. While in charge of the Serie A team Parma from 1996 to 1998, Ancelotti famously passed on an offer from the now legendary Italian playmaker Roberto Baggio to join his squad. Having dismissed these central talents from his purview because he preferred his frontline to play out wide, it took the monumental talent of his now assistant manager at Real Madrid, Zinedine Zidane, to convince Ancelotti to change his ways. The two met when Ancelotti left Parma to join Juventus, where Zidane was already a seasoned player. Ancelotti quickly realized that Zidane's talent would only be diluted by pushing him out wide to the left or right. Since then, his broader tactical vision and openness to experimentation has yielded great results. While managing AC Milan, Ancelotti discovered that Andrea Pirlo, primarily an attacking midfielder, could play a much deeper role and dictate the pace of almost any game by playing as a defensive midfielder just in front of the back four. This eventually led to his first Champions League trophy in 2003, where he primarily used a 4–3–1–2 formation. The following summer Ancelotti purchased the Brazilian midfielder Kaká. Their most successful year together was 2007. Kaka's dominating performance as a free-flowing second striker or inside forward led Ancelotti's AC Milan to another Champions League trophy that year. Under Ancelotti's tutelage, Kaká won the Ballon d'Or and the FIFA World Player of the Year. Now that Ancelotti has brought Paris Saint-German back to winning ways in just one and a half seasons, the question on every Madrid fan's mind is: Can he mold a winning style for Real Madrid as well? As of yet, what that style might be is still taking shape, but Real Madrid fans have every reason to be hopeful. Reunited with Kaká and with Zidane as his closest advisor, the preseason matches indicate that Ancelotti knows what he is doing. His rotating squad has scored 14 goals in 5 appearances, winning 4 and drawing 1. There has been a lot of speculation as to which formation will be Ancelotti's default positioning, with initial reports saying he would favor the “Christmas tree” lineup of 4–3–2–1. However, I think the experimental formations we've seen in the preseason are merely attempts by Ancelotti to fashion a functional backup plan. There is no reason to assume he'll completely abandon Mourinho's effective 4–2–3–1. After all, most people would admit that last season’s problems for Madrid seemed to come from some unacknowledged disharmony rather than a tactical deficiency. Ancelotti's primary job might be to unify the team and keep everyone satisfied with their roles. Which, given the number of personnel changes the squad has undergone, might not be easy. Madrid has been one of the busiest teams during the transfer window. Six players have departed, including Gonzalo Higuain, Raul Albiol and Jose Callejon. The four new players that have signed are Spanish midfielders Illaramendi and Isco, Spanish right-back Carvajal and Brazilian defensive midfielder Casemiro. 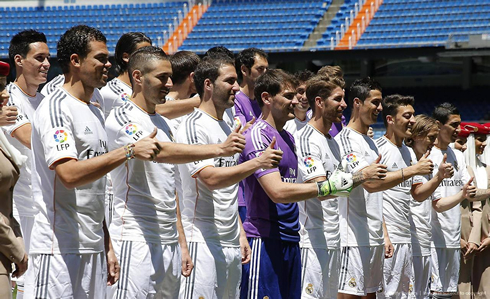 In addition, four players have been promoted from Real Madrid's B team to the first team squad. They are center forward Morata, left wingers Jese and Cheryshev, and familiar face center-back Nacho. Madrid appears to be steering away from the "Galacticos" mentality and moving toward a younger and primarily Spanish system. Perhaps by using young players that have linked so well with each other on their national teams they are hoping to bolster the team's camaraderie. Every player has been on display in the preseason friendlies. Ronaldo opened the scoring just 20 minutes into the first game against Bournemouth with a free kick from distance. He scored his second goal just 20 minutes later with a calm, low shot from inside the box where he was 1 on 1 with the keeper. His assist came from a superb long ball sent in by Isco, who has been impressing everyone with his vision and delivery. Nearly everyone got either an assist or a goal during the 90 minutes at Bournemouth, with Khedira, Di Maria, Higuain and Casemiro all finding the net. The match against third place "Ligue 1" team Olympique Lyon bore a haunting resemblance to some of Madrid's lackluster performances from last season. More than once last season Real Madrid found themselves behind, only to salvage a draw or manage a win at the last minute. By the 61st minute, the Merengues were down by 2 goals, thanks in part to Ancelotti's highly publicized and nerve-wracking experiment of playing Ronaldo as a center forward. Ronaldo was unable to finish any of his chances, looking as though he felt a little confined in the center of the pitch. It took a penalty kick from the unruffled 20-year-old Alvaro Morata, to turn the tide. In the last ten minutes, 21-year-old newcomer Casemiro scored an equalizing header from a corner, sealing a draw. The experimentation with Ronaldo's positioning continued for the PSG game, but early signs of the team's fluidity began to alter the starting formations. With many of the top teams, no formation ever stays pure on the pitch. It changes as players find or create space and drift in and out of position. That's what's known as reading the game. The better the players work together, the less discernible a traditional formation is. During the PSG match, and more heavily during the later match against LA Galaxy, Ronaldo could be seen drifting from the middle position to his more familiar slot at the left wing. After several deadly chances were squandered by PSG's frontline, Benzema scored the only goal of the match with a low shot to the far corner. Ozil squared the ball at the top of the box to provide Benzema with the shot. Ronaldo almost had an assist when he passed to Ozil who was wide open just to his right, but the German international's strike slanted wide of the post. Ronaldo himself had a few chances at goal, but goalkeeper Sirigu kept him frustrated. Real Madrid's defense hasn’t been at its peak so far, with gaps in Marcelo's defensive capabilities on display more than once, and Ramos being required to rescue him. Diego Lopez was lucky at times that PSG wasted some of the chances they managed to create. Ancelotti's former club appeared to still be reeling from his departure. Regardless of the experiment's outcome, Ancelotti shows ambition and attentiveness by taking one of the world’s best players out of his favored position. Ronaldo managed what he could on the inside track, making some trademark fast runs between defenders but rarely holding the ball. After a couple matches in this position, it was clear that, quite the opposite of what Ancelotti had experienced with Henry and Zola, Ronaldo was most effective on the outside, where he can hover like a shark, establish his own pace with the ball and plot his own course before going in for the kill. The first two goals in the 3 – 1 victory over LA Galaxy were courtesy of some superb, long overhead passes from Isco. The first ball was crossed over almost half the pitch to Ronaldo, who then squared it for the oncoming Di Maria who slotted it home. The next long ball sailed over the defense directly to Benzema's feet. He took one touch then sent it into the far corner. It was a poor clearance and lack of focus that allowed Galaxy to collect the ball and quickly outwit the backline for their first and only goal. A Benzema header from a Di Maria cross capped the match. Isco's precision passing was the main talking point, but displays of intelligence, pace and enthusiasm from Di Maria, Benzema and Modric, among others, should give Real Madrid reason to hope that the upcoming season could be one to remember. On the other hand, despite Ancelotti's willingness to use Kaká, few have been impressed with the 31-year-old Brazilian so far this preseason, as he appears to be as sluggish and confused as he was last season. But even without what looks to be the imminent arrival of Spurs star Gareth Bale, Real Madrid has one of the deepest benches in world football. 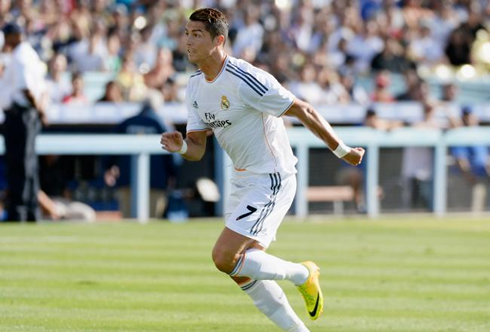 The standout stars, including Ronaldo, all seem to be enjoying their preseason football. Everyone seemed to be smiling, even twice-beaten goalkeeper Tim Howard, during the match against Everton. Seven minutes after Ronaldo's first ripple of the net was ruled offside in the 10th minute of play, the Portuguese became the first football player ever to score in Dodger Stadium. The goal came from an Ozil assist who sent a through ball to a runaway Ronaldo, who was bolting up the right side of the pitch. Ronaldo faked out the Everton keeper by taking the ball a touch wider and then sending the shot just past him. The second goal came when Modric chipped a long ball high up the pitch to an unmarked Ronaldo. CR7, looking to return Ozil's favor, brought the ball into the box then switched the ball over to the German midfielder, who was on the right of the keeper. Ozil simply had to tap it in. The two goals were enough for the win, despite Everton's keeper Tim Howard having made several fantastic saves throughout the night. They both also illustrated the brilliant nonverbal communication that Ozil and Ronaldo can share but that was too often absent last season. There are two matches remaining for Real Madrid this preseason, the first against Jose Mourinho's Chelsea, and the last against Inter Milan. Hopefully for Madrid fans the sparks of focus and brilliance that have been on display so far will be enough to light a fire this season. Cristiano Ronaldo next game for Real Madrid will be against Everton, this next Saturday (August 3, 2013), for the Guinness International Champions Cup semi-finals round. In the meantime, you can watch Real Madrid vs Chelsea, Thailand vs Barcelona, Manchester United vs Sevilla and Valerenga vs Liverpool, all matches provided from our live streaming section.